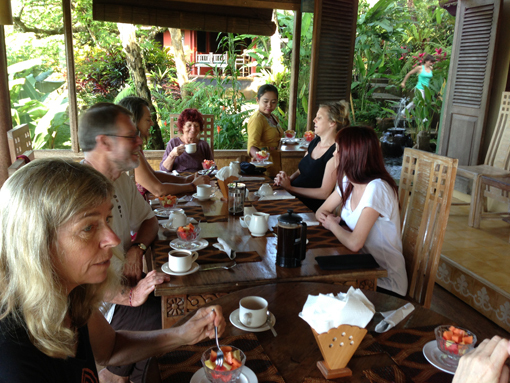 The 5th annual retreat ran from 21 - 27 May 2017 and once again offered an opportunity for participants to immerse themselves in the combined experience of mediation, Dharma inquiry, Yoga and Balinese spiritual culture. This retreat strongly emphasised moment-to-moment awareness of bodily sensations, which, along with sitting mediation practice, promotes an intimate and free comprehension to what is arising in our experience. 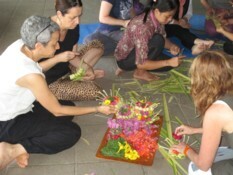 We marked the 5th annual retreat with a greater inclusion and emphasis on Balinese spiritual culture. 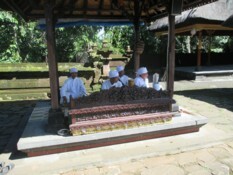 There was a welcoming ceremony performed by a local priest, making offerings to take to a ceremony performed by local Balinese priests in a forest temple, and a night of Joged Bumbung dance performed by 14 musicians and dancers in which the participants became involved, much to the delight of the local children! The Joged Bumbung is a traditional dance, and, as is customary for this sacred ceremony, the local community was invited. 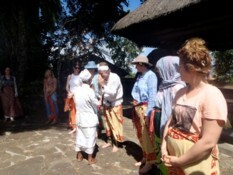 The presence of local families and their children enhanced this special experience. Each retreat experience is unique and ongoing. It is lovely to see so many people returning, in some cases year after year, allowing for deep friendship and connection. 2016 saw another very successful retreat with deep experiences of connection and understanding emerging from the group. Angela McGee led the yoga this year and the response to her teaching was very positive and many noted how this gentle mindful approach added to the depth of their experience. 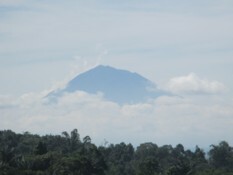 Bali Mountain Retreat centre showed itself once again to be an ideal location for inquiry and reflection. The natural beauty and the wonderful local Balinese staff nourished and opened our hearts, leaving us with a deep appreciation for this precious life. who had the good fortune to attend. to the ever changing sensations in the body. 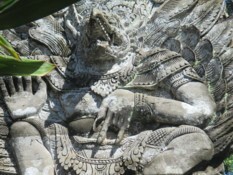 aching limbs and of course the sumptuous Balinese vegetarian meals. developed out of the silence, a deep sense of family and friendship. 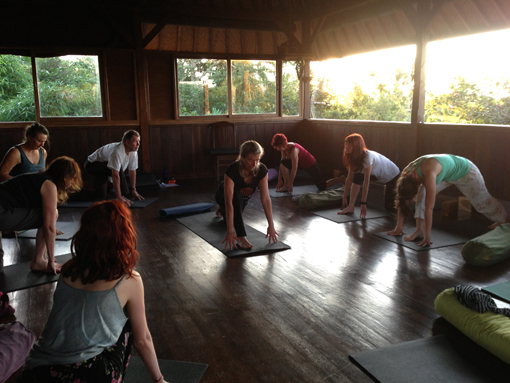 "This well balanced retreat was nurturing, and provided an ideal space to support insight and inner growth. 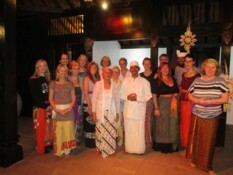 The intergration of sitting meditation, Dru yoga, mindful walking, wholesome vegetarian food, informative and succinct dharma talks, Balinese blessing ceremonies, opportunities for interviews and questions and the beautiful accommodation and garden setting at Bali Mountain Retreat all helped me to find some spacious awareness and peace". 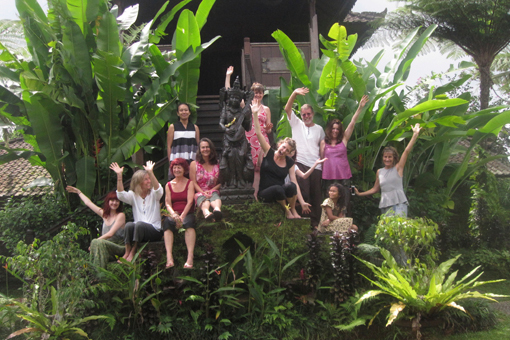 "Nestled in the lush gardens of Bali Mountain Retreat, the warm embrace of Balinese hospitality and the generous hearts of our teachers Will and Rob is a beautiful space to deepen exploration, intimacy and healing. To begin each day together by sharing yoga with the breathtaking Bali sunrise, and with eachother, is a wonderful way to open the heart and bring a closeness that remains still now. 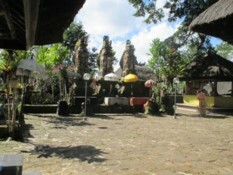 This connection to people and place is further enhanced with ceremony and prayers offered by the local Priest and Priestess and a visit to the local temple, and nourished by delicious vegetarian meals shared. Held in the kindness of Will's meditation instructions and Dharma talks we are nurtured by the quieting meditation and noble silence. Did I mention the cool caress of mountain breezes, or the indulgence of hot stone massages......"
The feedback from our first Insight Meditation and Yoga Retreat was enthusiastically positive. Bali Mountain Retreat Centre boasts traditional Balinese architecture, tropical gardens and fantastic views across the foothills to the sea. 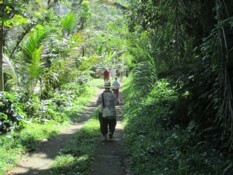 The retreat experience was enhanced by walks up Mt Batukaru into the rainforest, visits to the local village temple for traditional Balinese ceremonies to open the energy channels and bless our retreat, tasty Balinese vegetarian meals and daily massage. The combination of Sitting, Yoga, Inquiry, the natural beauty and contact with the rural Balinese culture led to much insight and awakening. "Will James is an extremely skilled teacher of the Dharma whose soft intelligence and wisdom pervaded every moment of the retreat. The retreat is a perfect introduction for anyone wanting to learn Vipassana in a nurturing and loving teaching environment. His approach is both disciplined and gentle, fostering self love and insight. Add this to daily yoga in shimmering dawn light, the beauty of a Bali mountain retreat, superb Indonesian food, and even a massage, this should be everyone's idea of 5 days of Nirvana! I have attended many meditation retreats and many yoga retreats , but none together, and the combined formula was magic for both body and soul. I intend making this retreat an annual gift to myself."